It’s a tough act to follow, when a play is a re-interpretation of a literary classic, and that, too, one written for the stage. Chitrangada, the musical dance-drama by Rabindranath Tagore, was staged in a new form by Red Polka Productions at Ranga Shankara, on Tuesday, the July 17, 2018. Having long read, watched and appreciated the literary and dramatic works of Tagore, I was eager to see what the new production would be like. The original dance-drama was written by Tagore in 1891, and is the story of Chitrangada, the only child of the king of Manipur. She is treated as the heiress to the throne, and behaves in every way like a prince: she even dresses in man’s clothes. In the treatment of the theme in “Chitraa”, allusion is made to her “darkness” of form; her eyes, lips, breasts, and feet. This angle, the physical appearance of external beauty, was the aspect that this production seemed to concentrate on. Chitrangada prays to Manmatha, the God of Love, to make her physically attractive. She is granted this new form for a year, though in the original, the form varies according to the seasons. However, when Arjuna, who earlier pleaded the vow of celibacy he had taken, in rejecting her, falls for her beauty, Chitrangada finds that she is not satisfied with the fact of his being attracted to her new form, and wishes that she had her old physical form back. This tension in her mind and how it is resolved, forms the rest of the play. The topic of physical beauty (and its importance vis-a-vis someone’s achievements and their personality as a whole), is certainly a topical one in these days of “Fair and Lovely” (not to mention “Fair and Handsome”!) but though the play started with an allusion to Chitrangada’s darkness, the play seemed to deal more with the general idea of feminine beauty rather than just that of dark skin. The dark-skin allusion was further diluted as the actor chosen to represent “Kurupa” (one who has an ugly form) was just as fair as the actor playing Shurupa, and (to me!) just as good-looking, which certainly confused me a little. The dance-drama atmosphere was maintained by the initial choreography where the dancers executed some beautifully choreographed movements. After this, the action moved more into the realm of drama than dance, but the choreographed movements of the couple in love (Chitrangada and Arjuna) kept the audience in touch with the dance aspect throughout. The costumes for the cast were lavish; the villagers had the touch of Bengal in their clothes, and the “alta” on the hands and feet of the dancers lent a Bengali touch, too. The white-and-gold of Shurupa’s costume contrasted well with the dark colours of Kurupa’s costume. Arjuna’s costume had the ascetic orange colour… a rather strange choice for a role of a lover almost throughout the play, but then, perhaps that was deliberately done. The set design was sparing, but effective. An arch often depicted a pathway out of the action, as well as some states of being, as when Chitraa as Shurupa is entwined with Arjuna, and we see Kurupa, her alter ego, in the arch; or when Kurupa is talking and we see Shurupa within that same arch (representing an alternative reality). Smoke was used to stunning effect during the play, even though the noise of the smoke machine did interfere at times. A ramp leading up to a raised area also brought in characters to the action of the play. I must mention the superb lighting design. In highlighting parts of the stage, and leaving parts dark at times, the action was enhanced, and the denouement brought forward. The arrival of Madana and Vasantha (the gods of the seasons), the appearance or disappearance of Kurupa or Shurupa… smoke heralded them. In this, I must mention the good special effects of the play. It was a bold stroke, too, to depict Madana and Vasanta as rather “camp” and bring in the element of genders other than the two traditional ones; however, this was milked more for some limp-wristed comedy, rather than brought out as a stronger part of the play. Madana and Vasanta, I must add, were so good at essaying their roles that they drew some strong applause from the audience at the end of the play. I must confess being rather disappointed with the role of Arjuna. The actor playing Arjuna did the best he could with his material; but Arjuna having been introduced as a man of valour, someone whom the redoubtable Chitraa has fallen in love with, it was less than satisfactory to have him brought out as a weak man, who is willing to let go of a sacred vow when faced with physical beauty. The role as brought out, did not show any reference to the brave man who won the heart of the brave maiden. Arjuna appeared rather wooden through the performance, though, of course, his choreographed moves were perfect. Another confusing point was when the period of a year (of Chitraa’s beauty) would come to an end. At one point, Madana and Vasanta bemoan that this is the last night of Chitraa’s beauty; but then, Shurupa continued in her role, until the end of the performance, so there was, in our minds, some uncertainty about the period for which Kurupa would be Shurupa. I must mention the excellent music. At every point, the music, enhanced by the good acoustics of Ranga Shankara, added to the effect of the play. The love sequences were dreamy because of the good music as much as the well-rehearsed and choreographed moves of the couple. The youngsters who played the flute at the outset, forming a kind of introduction to the action of the play, were good too; with a little more practice, they will set the tone for the production very well. The sound design certainly deserves praise in keeping up the tempo of the production. However, it was apparent that, this being only the 5th show of the production, several parts of the performance need to be streamlined. A gap when the lights went off; a fumble or two in the dialogue, some grammatical errors in the dialogue… elements like this can be eliminated with more rehearsals, and the production can become a seamless whole. The general tightening of the performance might also include a slight lessening of the duration of the play. The direction can be tightened up a little, and I think it definitely will be, as the play is staged more often. I was impressed by the excellent brochure brought out on the occasion, and was very happy that Anshulika Kapoor took the time to introduce the cast and crew, too. Since I did not have a photograph to use for this review, I have used the photograph that I took, of the cast and crew taking their bows after the performance. I look forward to watching the play again, when the production has evolved, and would like to see what elements have been retained and enhanced, and what parts have been discarded. 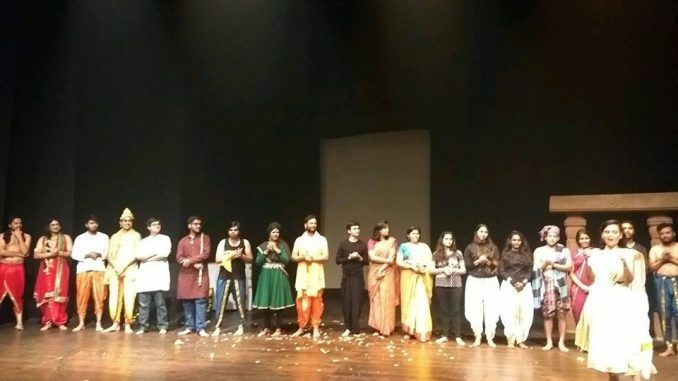 It was an evening of good visual and auditory entertainment, though I personally feel that the theme of beauty and its consequences, can be stressed even more, if at the expense of the dance-drama element that Tagore introduced to his work all those decades ago. Production Team: Santosh Patil, Pranati Sahni, Mahima Bijlani, Yamini Belwal, Ankhi Pal. 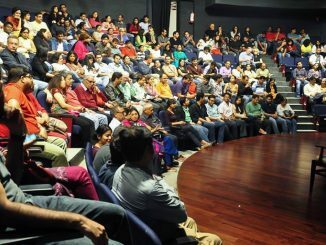 The team also acknowledged their gratitude to the stalwarts of Bangalore Little Theatre. 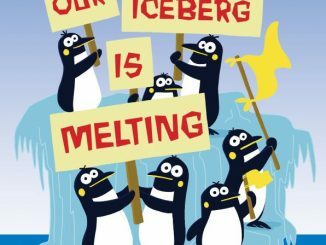 Bangalore Little Theatre’s annual children’s theatre production, Our Iceberg is Melting, is a musical on climate change, in support of Association for the Mentally Challenged.